Another sort of modern classic for me. It's taken FOREVER to nail this down in my mind. I've loved the SCB since the day it came out. A funky single cut with just a bit of a bevel. I've loved Tobacco burst since the first moment I ever held a Carvin catalog. I think it'll look nice over White Limba. I've always wanted a reversed inline - the new one is a perfect fit for me on this model. The visible neck through stripes are just one of those Kiesel things I love about these guitars. Royal Ebony should work nice with the overall scheme, and besides, I'm trying to own one of every fingerboard! All set to enjoy waiting around for a few months. Last edited by arahobob on Sat Aug 26, 2017 6:03 am, edited 2 times in total. Sometimes it takes a couple experiments to figure out what one really wants. I wish I could have bonded with tobacco burst, because I could have found some amazing used deals over the years that were perfect save for a finish that just didn't grab me. What do you think it is about the finish that drew you in? Here's a tobacco on mahogany SC90 for inspiration. Hey I get it! I'm not usually into the traditional bursts. But sometimes the right guitar comes along. For example, I love the 5steing Vader bass with 3 tone classic burst, which has been in-stock for a long time. So, I can totally see why you like an SCB this way. spudmunkey wrote: Sometimes it takes a couple experiments to figure out what one really wants. Great mock up photo! Thanks. I don't honestly know what it is about that color. I remember seeing a few LPs that color and really digging them. The classic sunburst is ok. I've never liked any sort of cherry burst edges. I just like that yellowish look over natural wood. Honey burst is very close, but there's just something magical to me about that black burnt edge. It's got a mean vibe about it. Man, that's going to kick arse, some nice aesthetic options there, the M22s should be wicked on this! The Zebra board and pickups will kill!!! Tabare777 wrote: Man, that's going to kick arse, some nice aesthetic options there, the M22s should be wicked on this! Zebra is saved for my inevitable HSS V6!!!! arahobob wrote: Great mock up photo! Thanks. For the record, I didn't mock it up...that's a real photo of a Tobaccoburst SC90. Well, I like SCBC6's, mostly. Arahobob has some really amazing guitars. Looking forward to this one, too. I knew what it was - I still love the fact you dug up a very similar build for me. You deserve mock up credit! I'm hopeful that the white limba will be more yellow than the hog. I realize that ash would've been the most yellowish, but im saving it for another build. I think the yellow on the white limba would look amazing! I think the SCB would maybe be in the top 3 of instruments that would look best in it, along with the Vanquish guitar and a Bolt/GH3. Mike assumed I was going with the hipshot. Apparently that's the most common bridge with the scb. I dig the M style / strung through the body. Has more of that old school look. Feels fine for me. The hipshot does have those pointy saddles, but I don't rest my hand there. Wow I just popped in to post my own new embryo and here I see your SCB thread happening. (I need to drop by here more often) I really think this build is going to deliver what you're going for man. Nods to the nostalgic look that first fired you up, combined with some edgier metal touches. I'll be shocked if it isn't fantastic. And I reeeeeally hope your REF is on the level of this latest we've been seeing like the ones in the GIS and on Kohschei's Vader. Absolutely stunning!! "Meaty enough for the mind, soothing enough for the soul"
Bovine wrote: Wow I just popped in to post my own new embryo and here I see your SCB thread happening. (I need to drop by here more often) I really think this build is going to deliver what you're going for man. Nods to the nostalgic look that first fired you up, combined with some edgier metal touches. I'll be shocked if it isn't fantastic. And I reeeeeally hope your REF is on the level of this latest we've been seeing like the ones in the GIS and on Kohschei's Vader. Absolutely stunning!! It's always fun working on builds with you in the virtual world! I'm glad you got your build under way too! There's always room in the waiting room. I think that the yellowness of the wood is all luck. I have seen some pretty white, white limba. But the white limba stripes in my walnut neck are really creamy and have more of that beige hue. I have an ash Jazz bass body for a project, which was bone white. But I think we have all seen some pretty yellow ash, from time to time. Last edited by Toptube on Sat May 06, 2017 11:41 am, edited 1 time in total. Toptube wrote: I think that the yellowness of the wood is all luck. I have seen some pretty white, white limbs. But the white limbs stripes in my walnut neck are really creamy and have more of that beige hue. Tobacco Burst is providing the yellow factor. White limba will be a perfect canvas. I wouldve really loved to do it over black limba, but I'd honestly have to hand select the wood myself for it to work for me! Lol. The final photo that pushed me over the edge on this one - it has that vibe I've been after! arahobob wrote: The final photo that pushed me over the edge on this one - it has that vibe I've been after! REQUEST: When you finally get this baby in, I think we deserve a demo of Tobacco Road --- In Drop D --- Ala David Lee Roth. Just sayin. Congrats on the coming build! It sounds like a guitar that you're building that will get better and better looking as it gets older and older. Do you know if it's going to be a two or three color tobacco burst? 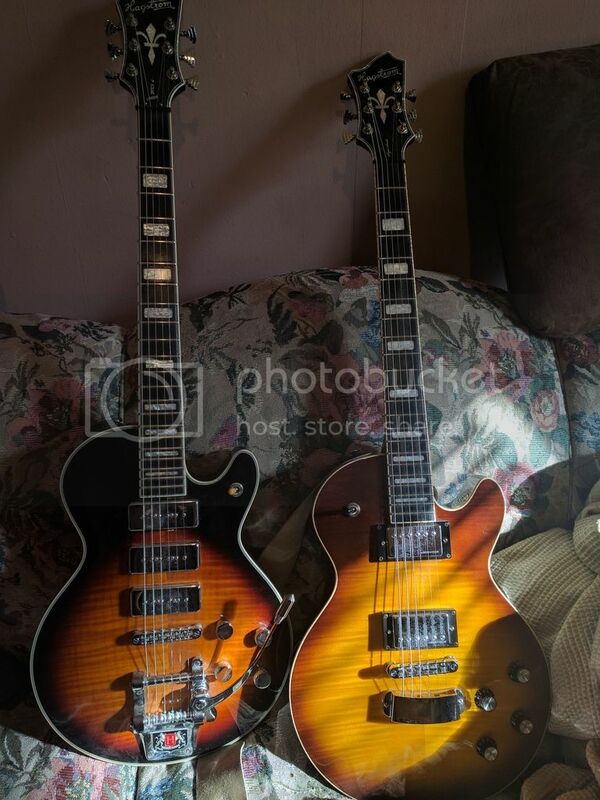 There are some like the ones shown that have just the two colors, where there's the body color which is like a vintage yellow (body color on traditional vintage or cherry bursts) that has a bit of orange/brown/umber/something like that mixed in to darken it, this is framed with a black burst edge which just fades into the the body color. Or, say, Ace Frehley's original Les Paul with the star decal on the headstock. The pic above of those two Supers is also a good example of the difference of the main body colors, from the orange-ish body of TSB and the straight Vintage Yellow of a classic LP cherry burst. I'm any case it'll be a cool machine! So you're getting all white limba, right? No top, just a contoured piece of Korina that will mimic a beveled top, like he does with an Aries with no top wood. Or will it be limba body/limba top? (That's what I'll be doing with the CS 6 when I order it... Korina body+Korina top, in vintage yellow with white bbe. Rosewood board on this one. Yours will have lots of midrange and a nice plunky piano like attack. Or should, anyway, with that big chunk of limba, and​ an ebony fretboard. Tobacco burst (as far as I'm understanding) is just a two color burst. Vintage yellow with a black burst edge. It's all in the paint department's hands. Vintage burst has more of that 3 color vibe. So yes, my build is a white limba body, no top. It'll be seen on the headstock too. Looking forward to my scb after as this time.